We love dumplings both sweet and unsweet. They are time consuming, but it is worth to do because they are delicious. Will be big surprise for family. To make the dough – Pour the flour into a clean work surface. Make a deep, wide well in the centre and pour in 1/2 cup of hot water, salt, egg yolk, melted butter. Stir with your fingers, staying in the centerat first and being carful that the water doesn’t breach the wall. Slowely add rest of hot water. Little by little, using your hand and a bench knife, mix in flour from the sides until the dough starts to come together. If the dough remains in shreds, sprinkle in additional water, a spoon at a time, until it begins to stick together. Don’t add to much water or thedough will be difficult to work. Knead the dogh for 10 minutes to form a smooth, firm, elastic ball. Put into a bowl and cover with a clean kitchen towel, and let rest for a least 30 minutes at room temperature. To make a filling– in a big pan cook the chicken, add the carrots, parsnip, black pepper seeds, season with salt. Cook in a low heat until the chicken is soft. Take off the checken from the pan and remove the bones and skin. Mill the chicken meat in a blender, but not to much. Chop the onions , in a frying pan melt the butter and add the chopped onions. Fry it until golden brown. Put the onion into the chicken mixture, season with salt and pepper to taste, it schuld be well-seasoned. If the mixture is so soft add some bulion. Roll out thinly and stamp out dough.Place a spoon of chicken mixture on each round and bring the edges of the dough together, pinching to enclose. 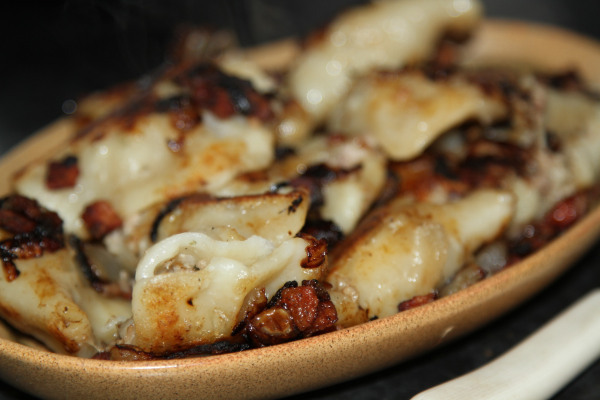 Throw dumplings into boilling water and cook for about 3 minutes. Take them out from the water and drain. Cut the smoked backon into smal ankles, onion chop finely. Fry the backon until nearly crusty and add the onions and fry until golden brown. Take everything from the pan, just leave a little of grease. 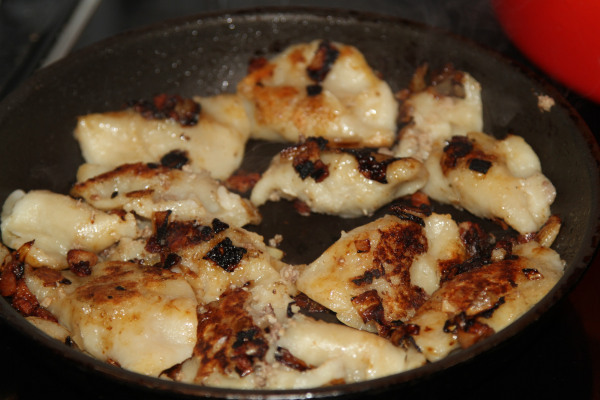 Put the dumplings in and fry in both sides until slightly brown. Serve at once. You can add some salad if you want.